Dr Gary Walsh, Chemical and Environmental Science Department, University of Limerick, Republic of Ireland. 1 Pharmaceuticals, biologics and biopharmaceuticals. 1.1 Introduction to pharmaceutical products. 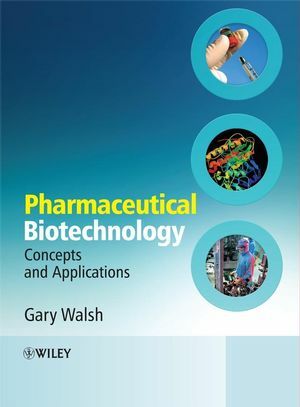 1.2 Biopharmaceuticals and pharmaceutical biotechnology. 1.3 History of the pharmaceutical industry. 1.4 The age of biopharmaceuticals. 1.5 Biopharmaceuticals: current status and future prospects. 2.2 Overview of protein structure. 2.4 Protein stability and folding. 2.5 Protein post-translational modifi cation. 3 Gene manipulation and recombinant DNA technology. 3.2 Nucleic acids: function and structure. 3.3 Recombinant production of therapeutic proteins. 3.4 Classical gene cloning and identifi cation. 4 The drug development process. 4.3 The impact of genomics and related technologies upon drug discovery. 4.10.3 Nasal, transmucosal and transdermal delivery systems. 4.14 The role and remit of regulatory authorities. 5 Sources and upstream processing. 6.4 Removal of nucleic acid. 6.7 High-performance liquid chromatography of proteins. 6.8 Purifi cation of recombinant proteins. 7.3 Removal of altered forms of the protein of interest from the product stream. 7.4 Detection of protein-based product impurities. 7.5 Immunological approaches to detection of contaminants. 7.6 Endotoxin and other pyrogenic contaminants. 8 The cytokines: The interferon family. 9 Cytokines: Interleukins and tumour necrosis factor. 10.3 Growth factors and wound healing. 11.6 Medical and veterinary applications of gonadotrophins. 11.7 Additional recombinant hormones now approved. 12 Recombinant blood products and therapeutic enzymes. 12.5 Enzymes of therapeutic value. 13 Antibodies, vaccines and adjuvants. 13.2 Traditional polyclonal antibody preparations. 14 Nucleic-acid- and cell-based therapeutics. 14.3 Vectors used in gene therapy. 14.4 Gene therapy and genetic disease. 14.5 Gene therapy and cancer. 14.6 Gene therapy and AIDS. 14.8 Oligonucleotide pharmacokinetics and delivery. 14.10 Cell- and tissue-based therapies.